Chef Leah Cohen's newest restaurant serves some of the freshest seafood you're likely to try in New York's underappreciated sister city. In the winter, most people don’t have much occasion to walk along the Jersey City side of the Hudson River. Downtown Jersey City, near Exchange Place, isn’t exactly a conveniently accessible hub of good food. (Even if you live just minutes away, as I do, it’s slightly too close to take the train, and just far enough that you won’t walk to walk; plus, there are far more restaurants to choose from in the more centrally located Grove Street area). Even if you’re in the neighborhood, you surely wouldn’t think to stop inside Harborside Atrium. Sure, there’s a gym next door, and an optometrist’s office inside, and it’s flanked on either side by office buildings, but in the evenings, the lobby of the shiny new mall is usually eerily abandoned. The only noise you might hear, if you’re willing to brave the cold to stop by on a weeknight, comes from the back corner of the mall’s main level. There, you’ll find Piggyback Bar, the newly opened restaurant from chef Leah Cohen (and her business partner and husband Ben Byruch) of the Lower East Side’s Pig and Khao. You might be surprised to find a bustling restaurant situated in the back corner of a shopping mall (it’s not walled off from the rest of the mall; there’s not even a separate entrance), and even if you decide to pop in for dinner, you might be expecting a meal more closely akin to what you’d find in a food court than a high-end restaurant. You’d be wrong. Chef Cohen’s new restaurant is exceptional. First things first: Try to grab a table near the floor to ceiling windows. There you’ll find your table overlooking the Hudson River, and the stunning Lower Manhattan skyline, twinkling with yellow lights left on in office windows. It’s a view that’s beautiful now—even as winter has reached its height—imagine what it will be like in the summer, when it’s temperate enough to sit outside. Once you're seated, you'll be presented with an extensive two-sided menu. 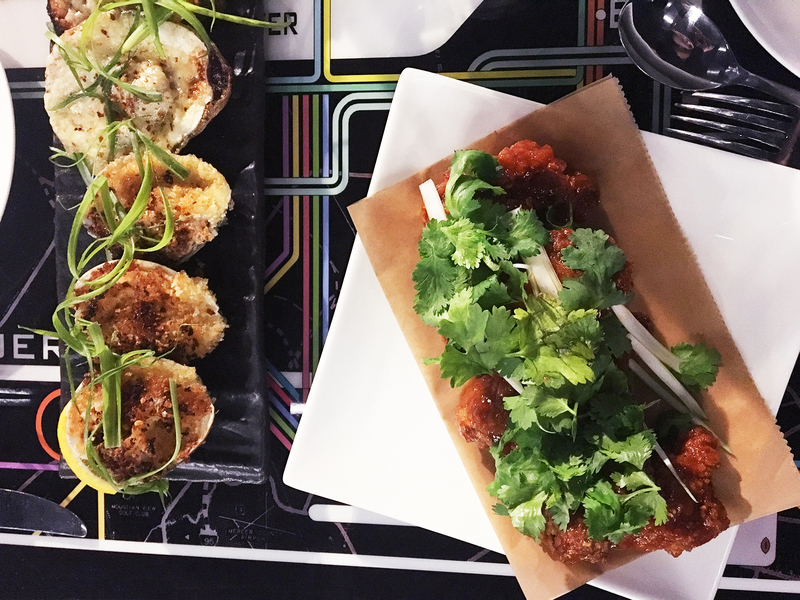 General Manager Ben Schmitt recommends the beef tartare, Hickory Smoked Half Bird, and the fried chicken sandwich, but on my most recent visit, I decided to indulge in a seafood-centric meal. My resolve to break a usually steadfast rule to keep fish and other sea creatures off my dinner plate led me to discover a near-perfect dish: the yellow curry crabcake, which is dipped in a layer of coconut milk. The crab cake is hands down the best thing I ate that night, and one of the most satisfying dishes I've eaten at a restaurant in recent months. 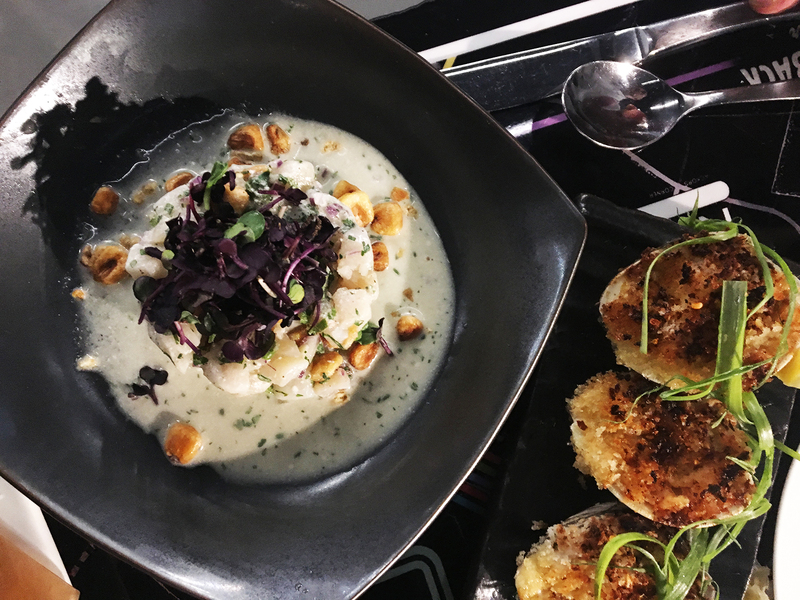 The ceviche is another stand-out offering, as a crisp, refreshing, citrusy cold soup. Piggyback Bar sources its seafood from a Philadelphia-based company called Samuel’s; still, the fish makes it to your table noticeably fresh, flavorful and tender. The plate of oysters and clams, grilled in miso butter panko, also make for a greasy but delightful snack. I did stray from my seafood motif for one dish, however: the Korean Honey Butter Wings. It was worth it. Better than even the Asian-inspired chicken wings at Talde (another Jersey City transplant), these crispy and yet simultaneously chewy bites are made with rich Gochujang sauce. The result is a subtle flavor with a spicy kick that isn’t overpowering. 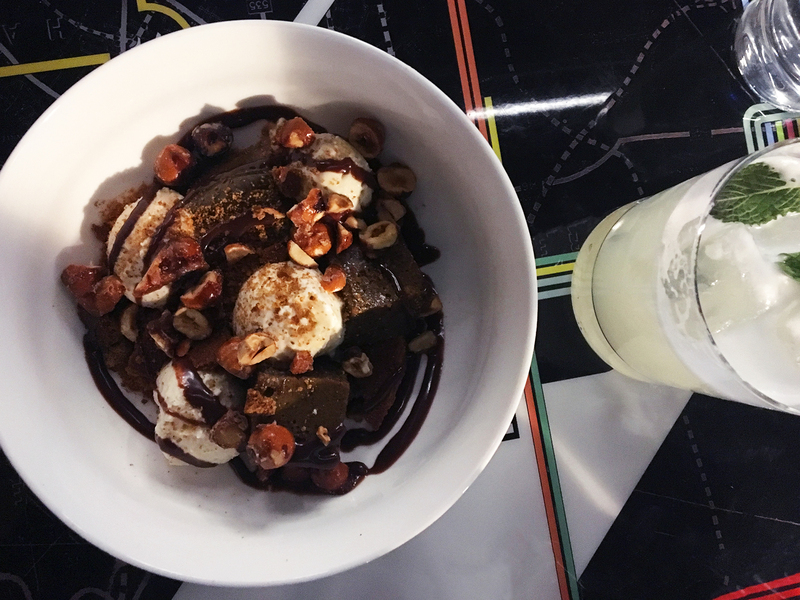 Cohen's food is well worth the slightly out-of-the-way trip to Jersey City’s equivalent of the Financial District, but what makes Piggyback Bar such a pleasant place to dine might be what a surprise it is. Even on my second trip to the restaurant, I felt a happy jolt of shock at the elegant plating of my food, the gin cocktail decorated with a sprig of mint and frothy egg white, in a place so devoid of all pretention, or snobbery. The plastic chairs in primary colors and tabletops decorated with subway maps (Schmitt promises better tables for the outdoor seating area will be delivered next year) might raise an eyebrow, but appearance says so little about Piggyback Bar. It easily delivers on its promise of satisfying, creatively crafted dishes, without the airs of Manhattan restaurant serving similar fare. In that way, it’s very much like Jersey City itself. The restaurant’s opening should serve as a welcome, though for some perhaps unexpected, revelation that New York does not have the monopoly on eating well. If chef Cohen's decision to bring her talent across the river is any indication, this is certainly not the last we’ll be hearing of Jersey City.